Facings all done so now I am feeling rather pleased with myself. Now to add some more squares. I have cut a few out and am lying them on the top and playing around until I like how they look. It's an imprecise art, since obviously the holes will be a bit smaller than the original bits of fabric, so I have to guess at spacings, but I quite like the not-quite knowing. Your improvisational style is so impressive, Kaja. It is always such a pleasure to watch your works in progress. Looking good! That looks wonderful! It looks like such a creative process. You got the facings done and now back to the fun part - Yay Kaja! I love following along your process, I'm more of a planner but always change in the making, not knowing makes me kind of nervous which is a good thing I think. 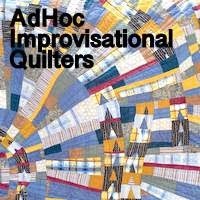 Important to stretch ourselves every now and again - I love how you make your quilts!